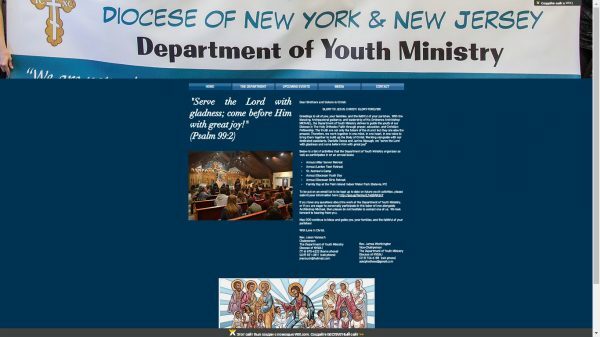 The Orthodox Church in America’s Diocese of New York and New Jersey is pleased to announce the launch of its new Department of Youth Ministry web site. With the Blessing of His Eminence, Archbishop Michael, this new platform offers easy access to information about upcoming youth department events and features a media gallery of press releases and photos from past events. The site will allow for on-line event registration in the near future. Although the activities planned by the Department of Youth Ministry are targeted to youth in the New York and New Jersey diocese, youth from other dioceses and jurisdictions are welcome to participate. The web site will be updated regularly and continue to expand over the coming months. Visitors are encouraged to explore the website and sign-up to receive emails announcing future events by submitting their information via Google Forms. “Our prayer is but one that through the new web site, the youth of our Church, together with the clergy and faithful, will become connected to one another, but more so become connected to the Church and to our Lord God and Savior Jesus Christ,” said Priest Jason Vansuch, Chairperson of the Department of Youth Ministry. If any parishes within or outside the Diocese of New York and New Jersey would like to have their youth events announced on the web site, please contact Father Jason at jvansuch@hotmail.com or Danielle Geeza at nynjocayouth@gmail.com.